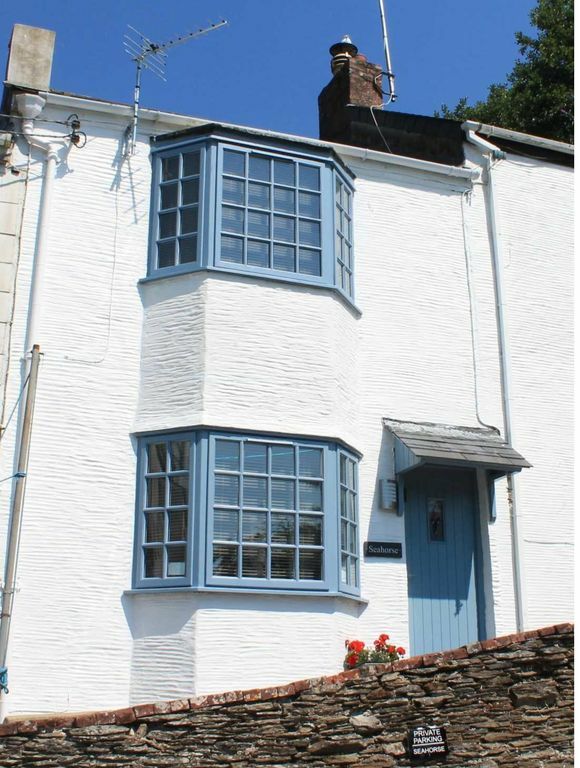 Seahorse is the most fabulous cosy one bedroom cottage with the benefit of parking, in a wonderfully quiet location only minutes from the town and beach. Beautifully furnished and renovated with wonderful river views, there is a stone seat outside to sit and watch the sun go down. Seahorse has gas central heating, super-fast Wi-Fi and a 48 inch Samsung TV with smart hub, there is also a hairdryer in the bedroom. Decorated and carpeted in grey and white with grey and oak furniture throughout and a superb electric reclining red sofa, at the end of your day sightseeing relax and sink into your lovely king size bed, there is a shower room with WC off the bedroom and another WC on the upper floor. There is a new kitchen with washing machine, dishwasher, fridge/freezer, microwave, oven and hob, it is well equipped with crockery/cutlery. All bedding, tea towels and towels supplied, but not beach towels. Arrival from 3 pm and departure by 10 am please. No smoking and no pets, sorry. Julie loves Looe and has bought Seahorse cottage for herself and her family and as a holiday home for others to enjoy. I bought this property because it has a lovely feel about it. It is quiet and is in a wonderful sunny spot with a fabulous river view only a couple of minutes from the railway station and 5 minutes to the town and a couple more to the beach. super position. It has parking outside so perfect. Looe is in a fantastic part of magical Cornwall and easy access to all the attractions. Days out from here are so easy. It is a terrific base to go exploring or just sit on the beach and relax The Looe railway line 2 minutes away which is a beautiful journey. There is also a bus stop there..
Upstairs there is a WC whereas downstairs off the bedroom there is a shower room with hand basin, shower and WC. Pillows, duvet, bedding and, tea towels are provided. Seahorse has a parking space outside the cottage. The wi-fi is really fast and works all around the house. All towels and tea towels but not beach towels. Lovely leather red electric reclining settee.. TV Samsung with smart hub. Samsung 48inch smart hub tv. There is no garden but you can sit outside the front and enjoy the evening sunshine. Seahorse has easy access to Looe and Polperro with its historic harbour. Travel further afield to the Eden project and other attractions. A great little cottage for two (or possibly three as there is a fold down bed).Very comfortable accommodation. Decent size TV, very comfortable bed. 10 out of 10 for cleanliness and plenty of those little things that help make the holiday go well. Very efficient shower but watch out for the sink,don't turn tap on full blast until you are used to it!Having a free parking spot outside the front door is an added advantage. Very comfortable electric reclining sofa ( I want one!). Plenty to do in Looe and surrounding area, great restaurants.Give the old Sardine factory museum a look and the Guildhall if you like local history. An ice cream topped with clotted cream from Martins dairy shop is a must.All in all we give the accommodation 10 out of 10. Thank you Stephen for your kind review, we are very pleased that you both enjoyed your stay. A lovely cottage which was very well equipped. We had a lovely week in a super cottage. The bed was really comfortable and the cottage had everything that we needed in it.To top it off we had a week of sunshine and clear blue skies! Thank you Barbara you were very lucky with the weather, we are glad you enjoyed your stay. Quaint, well presented and comfortable. We thoroughly enjoyed our stay at Seahorse Cottage. We loved how the living space had been moved upstairs to maximise the view. The accommodation was very clean and well maintained and felt light and airy despite the March grey drizzle. We appreciated allocated parking right outside the door and the cottage is well positioned to not need to drive anywhere. Local shops, pubs and restaurants all a pleasant stroll away. Hi Sarah, thank you for your lovely review, it's always good to get feedback from our guests. We are very pleased that you enjoyed your stay. Immaculate, cosy with a fantastic view. Very well presented and convenient for the town. Easy to follow directions made it simple to find the property and gave a good start to the holiday. On entering we were surprised to find the bedroom on the ground floor but once we went upstairs to the living room with the view over the bay we understood the reason. The property was clean and tidy throughout with easy to follow instructions for the heating etc. Thank you for your kind review, we are glad you both enjoyed your stay. What a great cottage and location. Absolutely perfect and owned by very nice people. Look forward to staying here again. Thank you Derek for your kind comments, we are glad you both enjoyed your stay at our cosy cottage. Lovely cottage with good pub nearby. Thanks for Xmas welcome pack. Great reclining sofa! Thank you David, we are glad you enjoyed your stay.